My youngest is having a birthday in less than two weeks, so birthdays have been on my mind as I plan his first friend party. He's turning three so he actually realizes what his birthday is all about this year and has some specific requests: Mickey Mouse, a doughnut cake and bubbles. I'll have to let you know how that all comes together. For now, you all need to know that I am a birthday person, I know not everyone is (my husband included) but I am one of those people that thinks you should be celebrated and pampered on your birthday and the day should be all about you. I am also one of those people who loves to hear about other people's family traditions. Birthday traditions, Christmas traditions, family vacation traditions, you name it and I like to hear about it. I love family traditions because I feel like they pull a family closer together. Like a lot of young families, our traditions are still emerging and evolving but whether or not we opt to do a bigger friend party or a family celebration these are the 4 elements I think of as birthday "must-haves" for my family. When I say "must haves" it's because these are 4 elements that are my go-tos year after year. To me, they are easy and they offer a good value for the money you are spending on them. I am a big believer in fun wrapping paper, balloons and streamers, a special cake (or dessert), plus a special party hat (or tiara) for the birthday child. All things that add to the general aura of celebration but don't necessarily require a lot of effort. On my kid's birthdays, I like to have their doorways decorated with streamers, balloons hanging down from the streamers as well, and a few balloons on the floor of their room for when they wake up in the morning just to start the day off with a bang. I know some people think this is over the top, but the way I think of it is that I only have so many years before the magic of balloons and streamers will wear off and I want to soak up all those moments with my kids while I can. They are going to have years and years where they can be serious and focus on serious things so why not give them this one day a year while they are young and it brings them such joy? For this particular birthday of my daughter's we had a family party. After waking up to her birthday decorations, we had the breakfast of her choice, I gave her a cute new dress to wear for her birthday and a tiara as well, she went off to school and then when she got home we went to The American Girl Doll Bistro to have a birthday dinner. Her doll joined us of course. Then after dinner we ended the day with having some family over for cake. 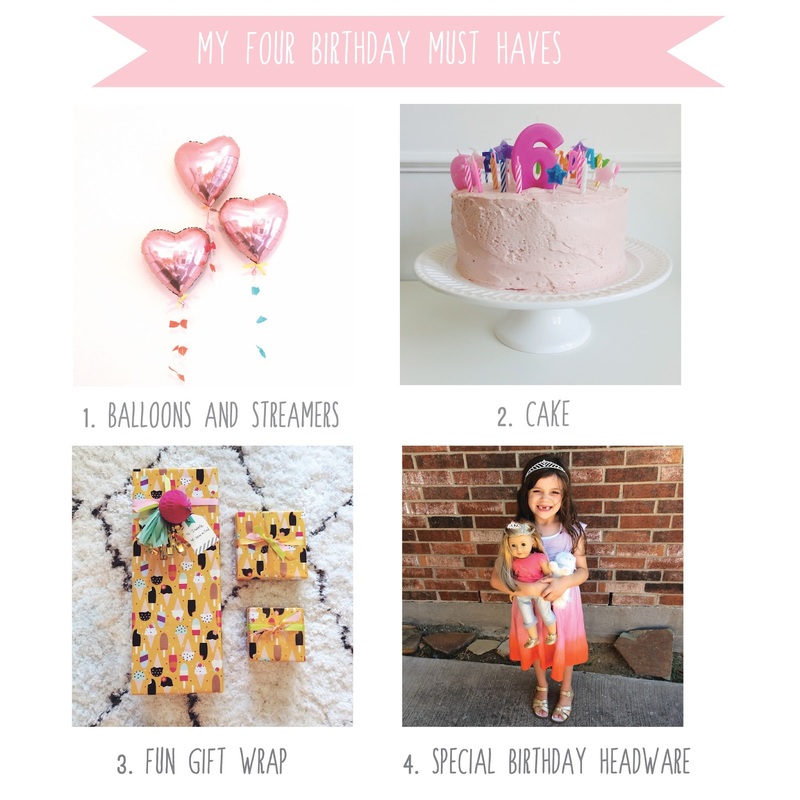 What are your birthday must haves? I'd love to hear. I loved this post! My daughters 5th birthday is this Thursday. Our plans for the day sound a lot like yours! Balloons in her room when she wakes up. Birthday banner hanging in the kitchen. Her choice of breakfast crepes. A fun new dress to wear. American girl store with mom and grandma for lunch, and then her dinner choice (spaghetti and meatballs) and a red velvet cake. I also love fun wrapping paper. We haven't done the birthday headwear- but that is so fun. I'm also a birthday person. I love for them to have their own special day once a year. My son's birthday is on the 4th of July, and while it's fun and exciting, I always feel bad that it's not just "his" day. I'm so glad you enjoyed it! It's always nice to know there are fellow birthday people out there!! Hope you daughter has a fabulous day as you celebrate.